A mundane commercial design of 1927 by architectural unknown J. Eckman, 174 Fifth Avenue might be completely without interest were it not also the location – from just a few years after the building was completed – of Eisenberg’s Sandwich Shop, “Raising New York’s Cholesterol Since 1929.” The suitably banged-up interior represents over 80 years of modifications and rivals Katz’s and the Carnegie Deli as a holdout of authentic New York lunchtime grit in the face of the city’s current gentrification. 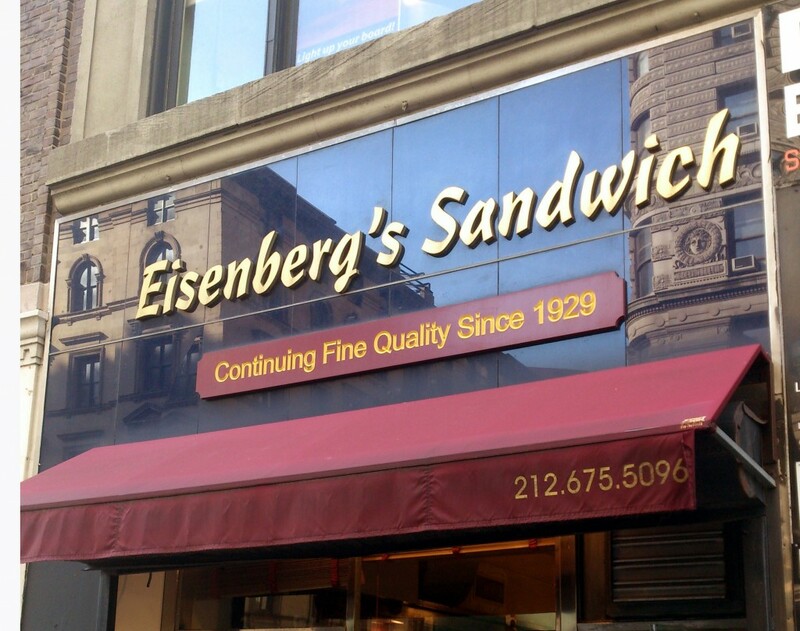 The Village Voice deems the tuna melt “perfectly imperfect,” and with luck Eisenberg’s will continue to delight palettes and clog arteries at its 174 Fifth Avenue location for another 80 years. The 22nd Street corner facades of 159-161 Fifth Avenue and the Flatiron Building are reflected in the Art Deco signage.